If you’re just now dipping into the synthesizer market for the first time, you’ve likely already realized that it’s just as vast as it is exciting. Though no one is complaining about being spoiled for choice, it can be difficult to pin down exactly what your list of choices should even be. Below, we've outlined some of the considerations that first-time synth buyers should take before deciding which synth is right for them. We've also included some of our best beginner synth picks to help you along with your decision. If you want to learn more about the basics of audio synthesis, check out our brief, simple introduction: How Do Synths Work. Or, for a longer look, watch our Intro to Synthesis video series. First, we'll start by briefly defining a few common synth terms and explaining what the components do. The world of synthesizers is wide and diverse, and many specific synths you'll come across will have many different features that aren't fully explained here. But if you're starting from scratch in your synth knowledge, getting familiar with these basic terms is a good place to start. Oscillator/Voltage Controlled Oscillator (VCO): Your synth's oscillator generates a simple electrical wave—sine, saw, square, or triangle—that is then sent through your speakers, converted into sound. A voltage controlled oscillator is one that can generate different pitches based on the voltage coming into it, which determines its frequency. Triggering a MIDI note or pressing a key on the synth feeds a different voltage into the VCO, thus affecting its pitch. Voltage Controlled Filter (VCF): Before the electrical signals generated by the oscillator make it to your VCA and then to your speakers, they pass through the VCF, which removes all frequencies that occur above or below or a certain frequency. Voltage Controlled Amplifier (VCA): After the VCF, the signal is fed to the VCA for amplification. In this way, it serves similarly to a volume knob. It can also be used as a gate, stopping the signal when you let go of a key rather than letting the oscillator sound in perpetuity. Low Frequency Oscillator (LFO): A low frequency oscillator produces low frequencies—mostly under 20Hz, the lowest frequency that humans can hear—and is often used to modulate other components of the synth, like the VCO, VCA, or VCF. ADSR Envelope: Your synth's envelope is responsible for controlling the VCA volume via four parameters: attack (the onset of the sound), decay (how long it takes the note to dissipate to sustain), sustain (the constant volume where the note remains after decay and before it's released), release (the point at which the note cuts off). Monophonic vs. Polyphonic: A monophonic synthesizer can only play one note at a time, while a polyphonic synth can play multiple notes at once. Monophonic synths are often smaller and less expensive than polyphonic synths for this reason—especially when it comes to analog units because of the less complicated circuitry—but you can find more affordable polysynth options if you're willing to go digital. 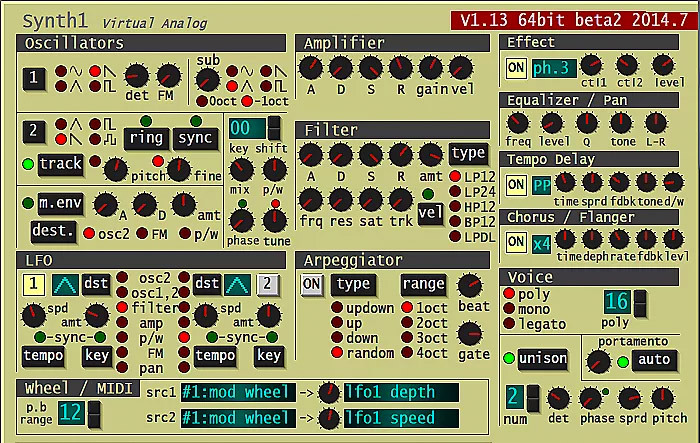 MIDI: Musical Instrument Digital Interface, or MIDI, is the name for the connection type and language by which computers, synths, drum machines, and other hardware communicate. Some vintage synths might not be MIDI-compatible out of the box, but there are aftermarket accessories you can buy to hook up your synth to your DAW and/or other synths. If you're after your first hardware synthesizer (as opposed to software synths—more on those later), you may already be facing the eternal analog versus digital debate. As you'd expect, everyone's opinion on the subject is different, with some players insisting that analog sounds warmer and more authentic and others saying they can't hear a marked difference between the two. Sonically, what it all comes down to is personal preference. But if this is your first synth and you're just starting out, we highly recommend an analog synth, largely because they tend to be easier and more intuitive to learn on. That said, we've included a list of solid, mostly budget-friendly picks in both the analog and digital categories. What Are Some Good Beginner Analog Synths? Korg Volca Keys: Debuting back in 2014, the Korg Volca Keys set a new bar for affordability in the analog synth market, providing players with tons of play modes (including unison, 5th matching, and ring modulation) and the ability to conjure up just about any classic synth tone imaginable. The Volca Keys also features MIDI, which is great if you're planning on picking up a few more synths and building out your setup down the line. Moog Werkstatt-01: The Werkstatt-01 was designed to teach people about the inner working of synthesizers and is super easy to mod as a result. Moog offers kits to that end for adding new features like MIDI, a second oscillator, an arpeggiator, and more. Great for DIY-minded beginners looking to get into Moog at the lowest possible price point. If you're set on Moog but have more money to spend, check out the Mother-32 for something more substantial and feature-packed. Arturia MicroBrute: Sibling of the larger MiniBrute, the Arturia MicroBrute packs many of the same sounds and features into a smaller and more affordable package. Synthesists not only get saw, square, and triangle oscillators, but also further processing for each type: Ultrasaw to detune and fatten up the saw wave, Pulse Width Modulation for the square wave, and a Metallizer for conjuring new timbres out of the usually mild triangle wave. The MicroBrute also packs a filter, a saturation circuit, and a mini patchbay with CV control, which will allow you to interface with modular gear. Korg Little Bits Synth Kit: The Little Bits Synth Kit is a super fun collection of small, modular oscillators, filters, envelopes, a keyboard, speaker, and more that players can endlessly tinker with in pursuit of learning more about the inner-workings of a synth. It's easy to rearrange and adjust the parts and is a super educational and engaging way to dip into synthesis for the first time. Korg Minilogue: If you already have some experience with synths or software synths, a more substantial budget, and/or a longer list of wants and needs, you should definitely check out the Korg Minilogue (or its more affordable sibling, the Monologue). It's an all-analog, 4-voice polyphonic synth with a feature list that includes a 16-step sequencer, onboard tape-style delay, highly routable LFO, and dedicated VCA envelope, among other things. What Are Some Good Beginner Digital Synths? Teenage Engineering PO-20 Pocket Operator Arcade: We recommend any and all of Teenage Engineering's Pocket Operator series, but the the P-20 Arcade is especially cool. It's a small, inexpensive, and fun synth that lets players sequence 8-bit beats and melodies using the 16 built-in effects either on its own, synced with other Pocket Operators, or recorded into software like Ableton Live. Bastl Instruments Kastle: If you're attracted to Bastl's unique, bespoke hardware synths, the Kastle is an affordable entry into the brand family. It's a hand-built, pocket-sized modular synth featuring two ports for interfacing with other gear, a stepped voltage generator with random 8- and 16-step loop modes, and a complex oscillator with three synth modes, LFO, and wave shape control. Lots of lo-fi character, and a fun entrance point to modular. Roland AIRA TB-3 Touch Bassline: Inspired by the TB-303 BassLine synth, Roland's AIRA TB-3 features a bank of 26 sounds modeled after the TB-303's circuitry, as well three more banks with new synth leads, basses, and effects. It integrates nicely with your DAW and can also operate as a two-in/two-out USB audio/MIDI interface. If you're looking for a robust digital synth but you're on a tighter budget, TB-3s can be found used for around $150. Though in choosing software synths—commonly called soft synths—you'll sacrifice the physicality that comes with hardware instruments, they can be a great choice for beginners for a multitude of reasons. For one, there are a lot of soft synths that are entirely free to download, which is great for brand-new players interested in previewing various features before thinking about hardware. Soft synths can also be great in the entirely other direction—if you know exactly what you want and the real thing is unattainable. Brands like Arturia, for example, offer high-quality emulations of a lot of vintage synths that would be prohibitively expensive for most people to add to their own studio. If you're looking to work with a classic unit you can't afford, a soft synth may just be the thing for you. What Are Some Good Beginner Soft Synths? Ichrio Toda Synth1: The Synth1 is modeled after the Clavia Nord Lead 2 Red Synth and boasts a feature set that includes two oscillators, two LFOs, 128 presets, 16-note polyphony, FM modulation, ring modulation, four types of distortion, tempo delay, stereo chorus/flanger, and more. Versatile and impressive, the fact that the Synth1 is completely free only sweetens the deal. DiscoDSP OB-Xd: Another great free choice, this soft synth pays homage to the famous Oberheim OB-X emulator and looks and sounds just like it. Arturia V Collection 6: While you may not be able to justify picking up the entire collection as a novice synth nerd, each individual soft synth in the collection still earns our recommendation. With very famous, familiar, and longstanding classic models to choose from—like the Prophet 5, Clavinet, and CS-80 to name a few—you can't go wrong starting with a soft synth by Arturia if you have around $150 to spend.